Formula One’s preseason tests have proven the cars are faster, with Valtteri Bottas crushing Circuit de Barcelona-Catalunya’s all-time track record earlier this week. However, they’ve also proven some of our worst fears about the thing that makes racing actually fun to watch: overtaking. These new cars look cool, but they are definitely hard to pass. The issue is exactly the same as it was before. We’ve got all this downforce and we need more mechanical grip. We need better grip from these bigger tires, and less downforce, whereas it’s gone the other way. Let’s hope the racing is fantastic, but don’t hold your breath, I would say. Hamilton went on to say that the turbulence is “easily twice as powerful” from the back of this year’s cars. So when you get behind a car, the car feels one way for a second and then you get a crosswind or something that you’re not expecting, or you lose front-end grip because the wind stops getting its force on the car, or the rear does, for example. It makes you have to lift and then you never get close enough. I experienced that behind several different cars, it’s not so easy. Hamilton also noted that both he and his team’s engineers warned Formula One that more powerful vortices would come out of the rear of the cars before the 2017 spec was finalized, but F1 went ahead with their plans anyway. I’m sure it will be more difficult to overtake. Today driving behind cars you lose a lot more downforce, the car is also much bigger. I did an overtaking today! It was on the Sauber, so ... I think it’s going to be tricky on the slow tracks, twisty tracks and fine on tracks with long straights. I think it should be pretty similar [to last year]. We will have to wait and see, but hopefully we won’t need to overtake. Today I have experienced a bit of close driving to other cars but it felt pretty similar. You have more downforce and you are going a bit faster through corners so it cancels it out a little bit. It should be all right. At the end of the day, F1 cars are not built to look cool. They are not built to win Cars and Coffee. They’re meant to compete with each other. To do so, drivers have to be able to pass each other on track. Less overtaking means that races become the conga line we’ve grown to hate in recent years. 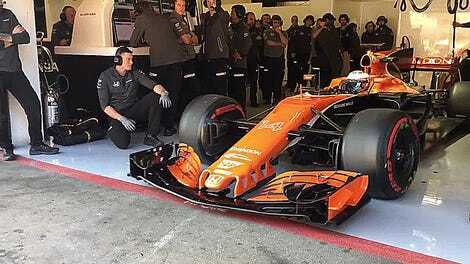 Fortunately, F1's new owners aren’t happy making the same old mistakes as the last group, as they showed by relaxing video rules during testing this week. How many trains of pain are we going to have this year before we get a major tweak announced to Formula One’s formula for 2019?